“Winter in Dubai? We have no winter here?” Probably this is the first thought that jumped into your mind. Yes, you are right, we have no real winter season here, but I am not talking about the weather. “Maybe he is talking about the new Ski slope in the Mall of Emirates.” No, you are wrong. I am not talking about the ice rink in Dubai either. I am actually concerned with the lifestyle in Dubai. We have no winter in our lifestyle in Dubai. What are the signs of summer? The heat, the bright sunshine, the lengthy daylight, the blossom of the trees and flowers; all manifested a bloom of releasing energy. In contrast, the coldness, meek sunshine, short days and the lonely shaft of the trees all marked the winter season, when all the energy signs disappeared. Does that mean the energy is gone in the winter? Yes, the energy is still there, but is hibernating, is recharging in the earth. In most parts of world, the seasons change in an even way, as the Chinese saying: yin and yang is balanced. In Dubai, however, it seems the summer is more welcomed and stays as long as it can. Some people think that summer all year round sounds like great fun as there must be constant exciting energy. But let’s look at the natural landscape of Dubai. What is it? It is deserted sand. Without the balance of the winter and summer, without adequate recharging on the soil, the land can only to be desert. A group of smart and young working force is out here in Dubai behind the driving force of the blooming entertainment industry. A common approach in this society is: “Work hard and play hard”. Yes, Dubai is a perfect place for it: fast pace, long working hours, good pay and plenty of entertaining options are available after work like clubs, restaurants, malls, and parties. Even on the day off, there is bright blue sky, sunshine and dunes, beaches, gyms, and brunches. Plus, Dubai is full of beautiful girls and handsome boys, bringing so many temptations. Too much excitement is happening here, for many people it is a waste not to make the most of it all. So people are geared up for one event to another. It is not uncommon for people to rush through several parties in one night. Lots of energy flows on the air profusely which signify the summer lifestyle dominates here as the weather does. Where is the balance between the summer and winter? But where does winter fit into the Dubai lifestyle? Where is the balance between the summer and winter? People often fail to ask these questions because they are too busy enjoying the summer. However, as a health practitioner, I can not stress these issues enough. More than ever, I have seen a rapid increase of smart and young people in my office asking for help. Their common complaint is stress, in other words: anxious, constant tiredness, mood swings, short-temper, poor sleeping quality, and so on. When we try to trace back the history of these problems, it seems that no obvious reason is there, but working hard and playing hard. To me, I put all of these cases as reasons for the imbalance of the winter and summer lifestyle. Without adequate recharging of the body and soul, the body can easily turn to be a bag of health problems. Someone may say to me: “you are trying to scare me because I feel tired occasionally and you are just trying to get me to come to your practice”. Some have been working hard, exercising hard and playing hard for years without any complaints from the bodies. Sometimes there is some tiredness, but that’s when mind over matter is used. If you are “pushing or dragging” it through the tiredness, then you’ll find that you feel fine again. It seems the more energy you spend, the more energy you have. But, sadly, that is only an illusion. One case of mine who visited me this month, explains it all. The lady was in her middle thirties and had worked in the fashion industry in New York for years. Beside the common complaint of tiredness, anxiety and poor sleeping pattern, she added an interesting comment about her exercise: despite how tired she felt, if she still forced herself to exercise five days a week, she would have 100% energy and it would last for a day. But she found she can’t stop her exercise that if she stop it for three days in a row, she would be dreadful and as if only ten percent energy is left in her. It seems the more energy she spends, the more energy she has. However, despite the energy she managed to get from the exercise, the spell of tiredness and anxiety began bothering her more and more frequently. In Chinese medicine, it is a typical signal that the body energy has been forced into the blossom of summer, as if forcing trees to grow leaves in the winter. Yes, the body might be energized for a short period, but you can just imagine what is going to happen when it runs with an empty battery for months or years to come. 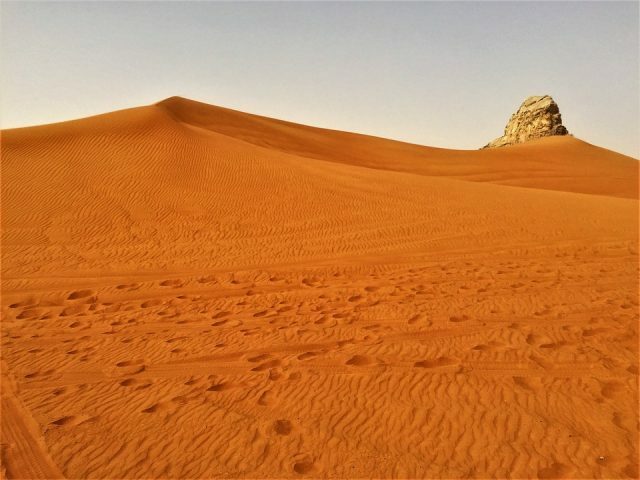 Is the sand of the Empty Quarter an appropriate symbol? Maybe. How to know when the body’s energy is having too much summer and endangering the winter? Look at two warning signals: feeling tired when waking up and a loss of appetite. Try to recall the last time you had a huge appetite when you were teenager. You could eat a horse and you have all the energy to run around and stay up late. The second morning, you are wake up feeling totally refreshed and can not wait for the exciting day to start. At that moment, you are fast recharging your energy from eating and good quality sleeping. So you have maintained yourself in a perfect balance of summer and winter with your energy. But since the first time you forced yourself to party till late and feel dreadful on the second day, since the first time you skip a meals to rush for work, your recharging channels are slowing down. The more you ignore your sleepiness and hunger, the less efficient your energy is recharged. Until one day, even after sleeping for eight or nine hours, you wake up feeling exhausted, as if you haven’t slept at all. Having a cold shower, drinking coffee, smoking cigarettes, after all the stimulates, the winter body is again pushed into the summer mode. Similarly, by grabbing a sandwich or salad between busy work schedule and quickly eating it without time to taste and digest your food, slows down the recharging in your digestive tract. When the appetite decreases, the bloating after meals and craving of sweet starts. For days and months, the winter body is crying inside because of the lack of recharging, but often the outside temptation still drags the body to carry on and on. When the body energy grows weaker, the energy of emotions is destabilized. The bad traffic seems more intolerable than ever, the anxiety seems to come from nowhere but from all the small issues at work. Finally, the peace of mind is gone and the physical illness is starting to appear. By now, you might not be surprised to know why so many people in Dubai are stressed. The lingering summer lifestyle has a serious impact on us. The next chapter, I will talk about how the winter of body energy can be initiated and be restored. — Reposting this post to support the World Mental Health Day. It was written decades ago for Dubai residents, but still relevant to our fast-paced lifestyle across the globe. More information on how to restore and recharge the energy, read ” the Energy Book“.